Oct. 30, 2017 11:45 a.m. 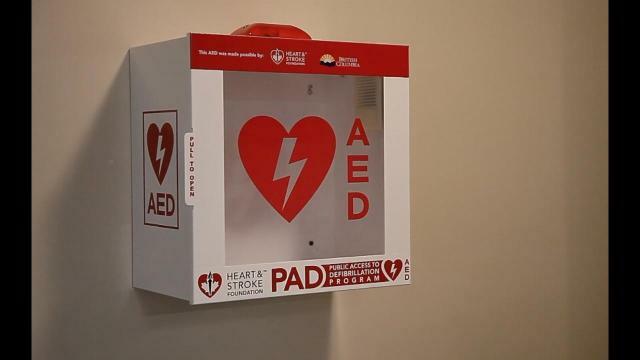 The Hawthorn Park seniors’ residence on KLO Road in Kelowna will receive a new, publicly available automated external defibrillator (AED) for their facility courtesy of FortisBC’s Power Peddlers Big Bike ride team. The team of FortisBC employees raised $13,300 for the Heart and Stroke Foundation of Canada, the top fundraising team for the event. The Heart&Stroke Big Bike is a team event geared towards companies, community organizations and groups of friends and families who each commit to fundraise in order to earn their seat on a fun, oversized bike and support the Heart and Stroke’s Foundation’s mission to prevent disease, save lives and promote recovery. The top fundraising teams in their region are awarded an automated external defibrillator (AED) for their community. The FortisBC team has raised $31,428 over the past four years for the foundation. “Placing more AEDs in our community fulfills our commitment to enabling faster, better cardiac emergency response and survival rates“, says Wendy Wright, community development coordinator for the Heart and Stroke Foundation in the Okanagan and Kootenays. In BC, a cardiac arrest happens every two hours. Bystander response is critical because chances of survival drop 7 to 10% every passing minute without CPR or defibrillation. However, performing CPR and using an AED immediately can double or triple chances of survival. The foundation believes AEDs should be as common as fire extinguishers. Once placed, an AED becomes part of the B.C. Public Access to Defibrillation (PAD) Program and will be linked to the provincial AED registry and the 911 dispatch system. That enables a bystander who calls 9-1-1 to be directed by a dispatcher to the nearest AED and coached on CPR. A partnership program between the Heart & Stroke Foundation and B.C. Emergency Health Services, the BC PAD Program has placed AEDs in public places around the province.